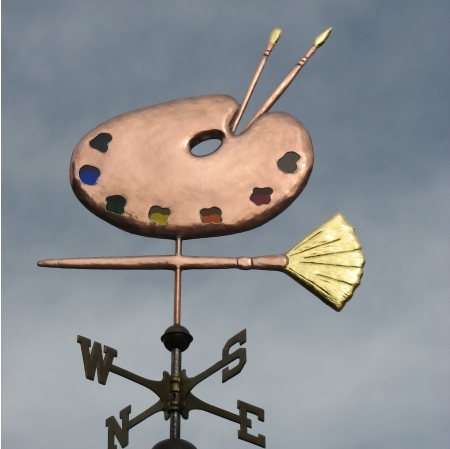 As you might imagine, our Artist’s Palette weathervane is popular with artists and has found its way to the tops of a number of private studios as well as art stores and galleries. 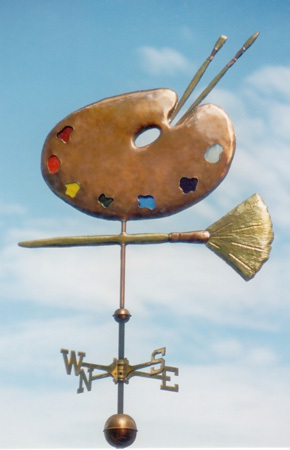 As shown here, the palette was crafted in copper with stained glass ‘paint’, brass paint brush handles and optionally gold leafed bristles on the paint brushes. We can also add optional palladium leaf to create silver colored ‘paint’ on the brush bristles. The stained glass ‘paint’ is included in the price of the weathervane and customers can send us color swatches of paints they like to use. We then go to our local stained glass supplier (who, not so coincidentally, has a variation of this weathervane atop her business) and match the color swatches to available selections of stained glass, creating a personalized color palette for each weathervane we make. 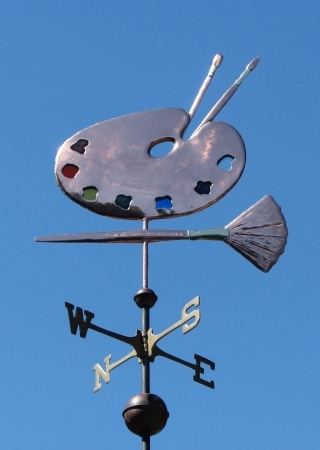 If you own a gallery or wish to advertise your work, the price of the weathervane includes a stamped inscription on the surface of the horizontal paint brush. Many of our customers have used their weathervanes to promote their business; a traditional method of advertising that has its origins in colonial times. 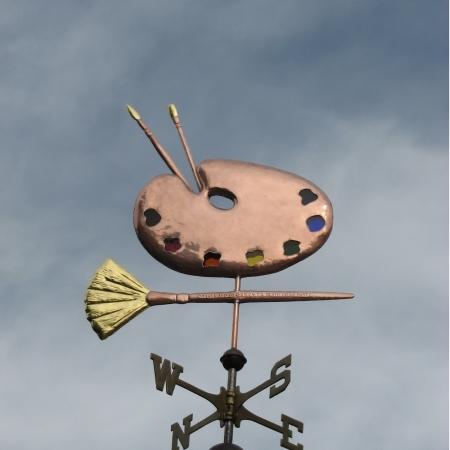 This weathervane makes a wonderful gift for the artist in your life. When the light is right, the stained glass creates a spectrum of luminous color that reflects the palette of the recipient. 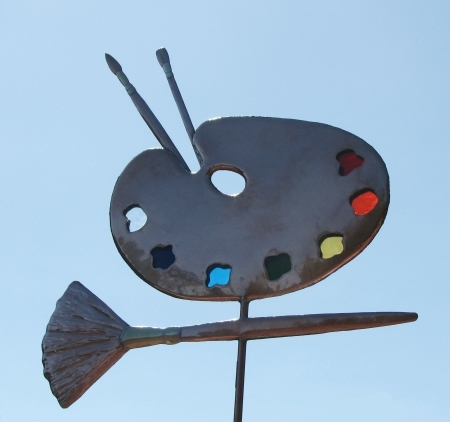 Whether installed in a garden setting, on a studio in one’s backyard or on top of a prominent art gallery, the Artist’s Palette Weathervane is an immediately recognizable and vivid symbol of artistic passion.